Nutrients to improve mobility or maintain optimal joint health in any dog. Pork Liver Flavoring. 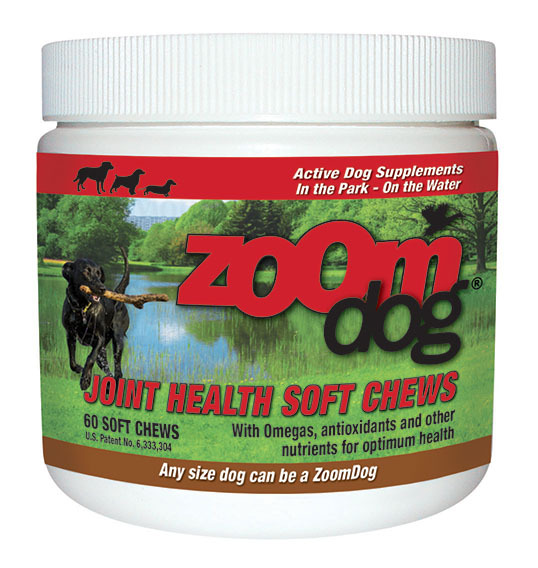 Also available in a 120 ct.
ZoomDog Joint Health Soft Chews were designed with every dog in mind. If your dog is large, small, active or more sedentary, ZoomDog Soft Chews will help your pet be their best. The nutrients in our soft chews may help to improve mobility or maintain optimal joint health in any dog. The chews also have other beneficial nutrients including vitamins and minerals to help keep your dog healthy and active. ZoomDog ingredients are thoroughly researched and the formulas specifically designed with your pet's well-being in mind. Formulated with glucosamine, chondroitin, collagen, polyphenol antioxidants, spirulina and other essential nutrients for joint health, these soft chews make a healthy, tasty supplement that your dog will look forward to every day. Glucosamine and chondroitin sulfate are common joint health ingredients in pet supplements. They are beneficial for joint mobility and strength but a complete formula will also include collagen and antioxidants. Collagen provides structural strength to ligaments and tendons. Hydrolyzed collagen is important for bioavailability to ensure this beneficial ingredient reaches the joint tissue. The low molecular weight helps improve the absorption of its amino acids to provide more of the building blocks necessary for making healthy cartilage. Hydroxyproline makes up 10% of collagen and is not readily available from food so supplementation is important for healthy joints. The structure, flexibility and strength of cartilage is due to collagen. Strong cartilage is important for strong, healthy joints for active dogs, older dogs and dogs prone to joint problems. Polyphenal antioxidants from plants are especially helpful for joint health. The OPC antioxidant in ZoomDog joint products is a plant extract that has oligomeric proanthocyanidins (OPCs). OPCs are in extracts of curcumin or tumeric, pomegranate, pycnogenol (pine bark) cranberries or grape seeds. Polyphenol antioxidants can fight free radical damage to joint tissue, they support strong connective tissue and help keep collagen fibers healthy. Tissues such as joint cartilage can be weakened by oxidative stress, injury, wear & tear from running, jumping, hiking, and aging. Your pet's body does have antioxidant systems built in, but in times of stress or in older dogs, they may not be enough. Glucosamine is an important ingredient for healthy joints. It is a major component of hyaluronic acid (HA) and is preferentially used in the synthesis of HA. The primary function of HA is attracting and holding moisture in the joint capsule. The re-infusion of water into cartilage in the joint capsule caused by glucosamine and HA will plump it up to restore much of its shock absorping properties. Glucosamine supports your pet's ability to generate new joint tissue, supporting joint health, strength & mobility. Chondroitin sulfate is another important glycosaminoglycan used for joint health. It can help minimize the impact of enzymes that damage collagen fibers along with the OPC antioxidant. Manganese is a trace mineral that can act alone as an antioxidant and is also a cofactor of the superoxide dismutase antioxidant system in your pet's body. Manganese is required by the body to maintain the strength of tendons, ligaments and bones. Vitamin C is an important antioxidant and necessary for collagen synthesis. It helps maintain normal connective tissue and will also stimulate the production of hydroxyproline, a necessary component of collagen. Cysteine is an antioxidant that increases the body's own supply of glutathione, an important antioxidant found in every cell in the body. Cysteine is a sulfur-containing molecule which can donate its sulfur groups to collagen for proper cross-linking and to proteoglycans to help them maintain their proper structure and function. It works with glutathione in the liver to detoxify dangerous compounds and is important for protein synthesis. Zinc is another important trace mineral that functions as an antioxidant, promotes healthy skin and supports immune function. Spirulina is a highly nutritious superfood, 65-71% protein, which contains many essential amino acids, antioxidants and other beneficial trace nutrients. It is appearing in other joint formulas as its benefits become better known. Omega fatty acids are a popular supplement for skin & coat and joint products. They work to keep cell membranes healthy in both joint tissue and your pet's skin. MSM is helpful in joint formulas because it supplies sulfur to the body supporting cartilage synthesis. The amount of MSM decreases with age, so older pets will benefit from it as they age. These joint health nutrients make the soft chews a unique, complete product for your dog. The other beneficial ingredients provide nutrients that support optimal health in dogs of every size, breed and age. Compare the recommended amount for initial use to other products! Just 7 days of double usage compared to 4 to 6 weeks for other joint products keep it affordable while still providing a positive response in over 90% of the dogs using this formula in 10 days. Double the recommended usage for the first 7 days. Administration may be divided into a.m. and p.m., if desired. For younger dogs with no current joint needs, you may give half of the recommended daily amount for maintenance. Other Ingredients: Vegetable glycerin, Macrogol, Soybean oil, Dried molasses, pork liver powder, Vegetable starch, Sucrose, Vegetable fiber, Brewer's yeast, Calcium phosphate, Fish oil, Magnesium stearate, Natural antioxidant blend (Tocopherols and Rosemary). ZoomDog products can be used by dogs of any activity level, size or life stage. 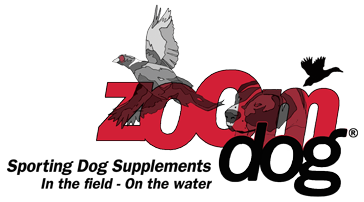 Our safe formulas and weight-based daily recommended amounts ensure that any dog can be a ZoomDog! Should I use ZoomDog Soft Chews or Hunt Dog Hunt? ZoomDog Hunt Dog Hunt has extra antioxidants and nutrients in its formula to help with endurance, performance and recovery. Hunt Dog Hunt would be the best choice for performance and working dogs, as well as dogs recovering from injury or surgeries. Hunt Dog Hunt comes in a chewable tablet that most dogs love. It is also easy to crumble to put in food or another treat for easy feeding. ZoomDog Soft Chews have high quality ingredients that provide joint health for dogs who don't undergo the rigors of a working or performance dog. ZoomDog soft chews are a great choice for small dogs, older sedentary dogs or young dogs who just need a maintenance formula. If your dog is a picky eater, the highly palatable soft chew may be the best choice. Where do the "Other Nutrients" on the label come from? Zoom Dog puts a lot of thought into our formulas, so that there are natural, safe nutrients in every product. The 'other nutrients' listed on the ZoomDog soft chew label come from ingredients such as spirulina and pork liver. Daily recommend amounts are listed by weight, so make sure you have a current weight on your dog for best results. The recommended daily amount starts at 1 pound and goes up from there. Please see the "Recommended Usage" for specific recommended amounts. If you have a young active dog with no current joint health issues, half of the recommended daily amount may by used for maintenance. Many people see results within the first two weeks. Make sure you double the recommended usage for the first 7 days, as stated on the label instructions. Supplements can take up to four to six weeks to develop significant results. Zoom Dog is fantastic,I adopted an older dog,had a shaggy coat and itchy problem.Started giving Buddy Zoom Dog and hisfomer owner saw him and could hardly recognize him.The former owner kept exclaiming"Look at his coat! Wow!" I take him for a "Spa Day"and his coat is always the talk of the groomers. Thanks for making Buddy happy. No itching,mno licking paws and a beautiful coat.